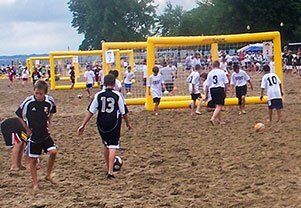 One day 4v4 and GK (5v5) Beach Soccer tournament open to both youth and adult soccer players from the Western NY area. Proceeds will go to help support Camp Good Days and Special Times, providing support and Summer Camp adventures to children with cancer. Registering for the tournament is done through gotsport.com, with an entry fee of $299 per team. Team rosters consist of 8‐12 players in a wide range of age groups, and proceeds raised will directly benefit the families of children who are currently going through cancer treatment. Whether you’re new to soccer, a fan, or a lifelong player, Soccer on the Beach is a great way to enjoy some fun in the sun while meeting others and raising money and awareness for Camp Good Days and Special Times. 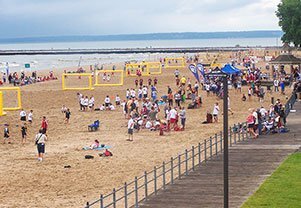 If you and your team are ready to kick off your shoes and kick up some sand, we can’t wait to see you at Ontario Beach on August 3,. The entry fee is $299 per team (8-12 player rosters) and is open to players of all ages. Sign up by registering on the secure Got Sport website, and feel free to write to e-mail us for more information or specific questions.